Pseudolymphomas are a group of disorders, which clinically and histopathologically mimic lymphomas. A 38-year-old female presented with a plaque over the forehead. A biopsy revealed a nodular infiltrate of lymphocytes that was suggestive of pseudolymphoma. The lesion spontaneously regressed over 9 days of biopsy, leaving behind hyperpigmentation. Cutaneous pseudolymphoma refers to a heterogeneous group of benign reactive T- or B-cell lymphoproliferative processes of diverse causes that simulate cutaneous lymphomas clinically and/or histologically. 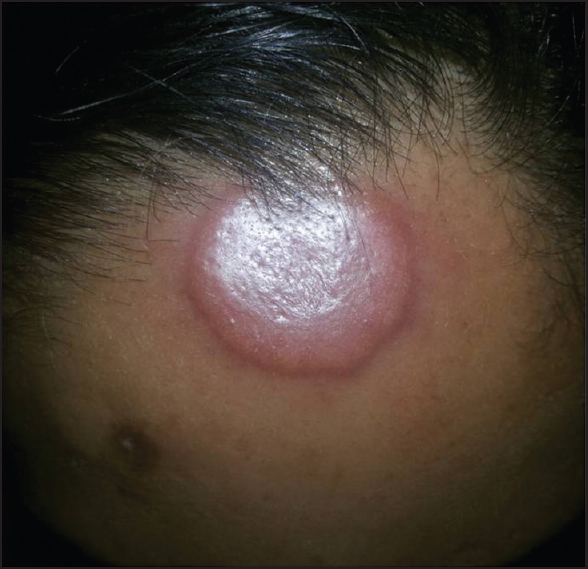 A 38-year-old female presented with a single asymptomatic erythematous annular plaque 4 × 3.5 cm over the forehead since 2 weeks [Figure 1]. The plaque was firm and nontender. Sensations were normal over the plaque. The lesion reportedly began as a reddish, small, round, raised lesion that had gradually increased to the current size. There was no nerve enlargement. There was no clinical evidence of sensory or motor deficit. She also gave history of a similar lesion over right forearm 8-10 months ago that had spontaneously subsided over 2 weeks. There was no history of photosensitivity. She gave no history of insect bite or any recent travel. There was no history of prior drug intake. She had no history of cough, fever, or weight loss. The patient was investigated with a differential diagnosis of granuloma faciale, pseudolymphoma, borderline tuberculoid Hansen's disease, and sarcoidosis. Biopsy showed a dense diffuse and nodular infiltrate involving the upper dermis sparing the subepidermal zone and collagen bundles. The infiltrate was composed of lymphocytes and histiocytoid cells and a few eosinophils involving the whole of the reticular dermis and extending to the subcutis. Most of the nodules showed the formation of lymphoid follicles. A number of blood vessels was seen within the lymphoid follicles. These features were suggestive of pseudolymphoma [Figure 2] and [Figure 3]. The infiltrate was superficially located (top heavy) and polymorphic, and there was formation of germinal centers. There was a proliferation of blood vessels. The above features helped to differentiate it from lymphoma histopathologically. Immunohisochemistry could not be done as the patient could not afford it. The plaque progressed over the next 4 days after presentation; however, it gradually regressed spontaneously over the next 5 days leaving behind hyperpigmentation. Pseudolymphoma is the term used to describe skin lesions that simulate lymphoma, primarily histologically but sometimes clinically, which at the time of diagnosis appears to have a benign biologic behavior and does not satisfy the criteria for malignant lymphoma. Based on their lymphoid subset composition, they have been divided into T- and B-cell pseudolymphomas. Cutaneous T-cell pseudolymphomas include idiopathic cutaneous T-cell pseudolymphoma, lymphomatoid drug reactions, lymphomatoid contact dermatitis, persistent nodular arthropod-bite reactions, nodular scabies, actinic reticuloid, and lymphomatoid papulosis. Cutaneous B-cell pseudolymphomas (CBPL) include idiopathic lymphocytoma cutis, borrelial lymphocytoma cutis, , tattoo-induced lymphocytoma cutis, , post-zoster scar lymphocytoma cutis, , pseudolymphomas posttrauma,  gold pierced earings,  and some persistent nodular arthropod-bite reactions. Cutaneous lymphoid hyperplasia (CLH) is the preferred term to denote B-cell pseudolymphomas. 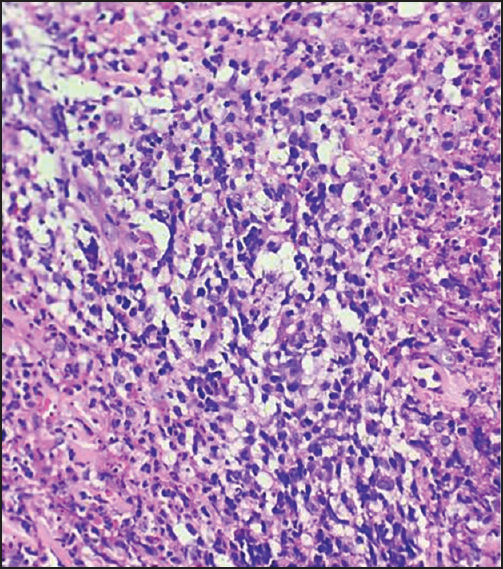 The large cell nodular form that has large pleomorphic lymphocytes and frequent mitotic figures that can be difficult to distinguish from lymphoma. Treatment options include exision, topical steroids, intralesional steroids, antibiotic, tacrolimus, systemic steroids hydroxychloroquine, and photodynamic therapy. This case has been reported for its self-resolving nature after biopsy. Ploysangam T, Breneman DL, Mutasim DF. Cutaneous pseudolymphomas. J Am Acad Dermatol 1998;38:877-97. Prabhu V, Shivani A, Pawar VR. Idiopathic cutaneous pseudolymphoma: An enigma. Indian Dermatol Online J 2014;5: 224-6. Sori T, Rai V, Pai VV, Naveen K. Facial nodule: What is your diagnosis? Indian J Dermatol 2013;58:248. 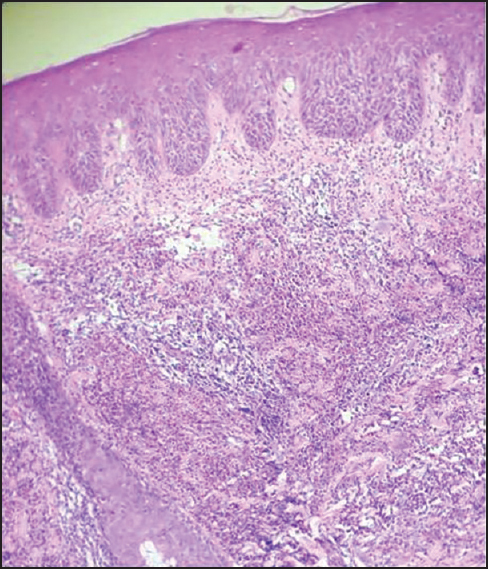 Kandhari R, Kandhari S, Jain S. Borrelial lymphocytoma cutis: A diagnostic dilemma. Indian J Dermatol 2014;59:595-7. Albrecht S, Hofstadter S, Artsob H, Chaban O, From L. Lymphadenosis benigna cutis resulting from Borrelia infection (Borrelia lymphocytoma). J Am Acad Dermatol 1991;24:621-5. Pasolini G, Ghidini P, Arisi M, Pedretti A, Ungari M, Pinton PC. Pseudolymphoma tattoo-induced. Dermatol Reports 2011;3:e47. Roo E, Villegas C, Lopez-Bran E, Jimenez E, Valle P, Sanchez-Yus E. Postzoster cutaneous pseudolymphoma. Arch Dermatol 1994;130:661-3. Kobayashi Y, Nanko H, Nakamura J, Mizoguchi M. Lymphocytoma cutis induced by gold pierced earrings. J Am Acad Dermatol 1992;27:457-8. Sandbank M, Barr-Nea L, Ishay J. Pseudolymphoma of skin induced by oriental hornet (Vespa orientalis) venom. Arch Dermatol Res 1978;262:135-41. Brodell RT, Santa Cruz DJ. Cutaneous pseudolymphomas. Dermatol Clin 1985;3:719-34. Hammer E, Sangueza O, Suwanjindar P, White CR Jr, Braziel RM. Immunophenotypic and genotypic analysis in cutaneous lymphoid hyperplasia. J Am Acad Dermatol 1993;28:426-33. Wood GS, Ngan BY, Tung R, Hoffman TE, Abel EA, Hoppe RT, et al. Clonal rearrangements of immunoglobulin genes and progression to B cell lymphoma in cutaneous lymphoid hyperplasia. Am J Pathol 1989;35:13-9. Cerroni L, Kerl H. The use of monoclonal antibodies on paraffin sections in the diagnosis of cutaneous lymphoproliferative disorders. Dermatol Clin 1994;12:219-29. Mehta V, Balachandran C, Hameed S. Lymphocytoma cutis following excision arthroplasty. Indian J Dermatol 2011:56:104-6.